A special type of contact, where two parties agree to sell or buy goods/shares at a given price on a given time in the future. The two parties that are entering the contract will predetermine the price and the date of purchase of the good, share, stock or any other item. The product would then be purchased at the date for the price that was set. If the price of the product is higher than then purchase price set, then the buyer benefits and if the price is lower, then the buyer suffers the loss. 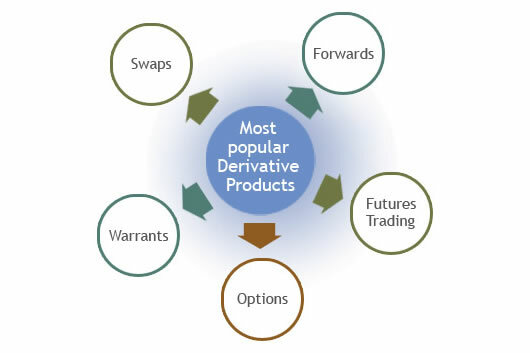 Futures contracts, forward contracts, options, swaps and warrants are common derivatives. These are often used for speculating and hedge funds. Example includes if two parties (buyer and seller) decide that the buyer will purchase 100 stocks of XYZ Company at USD 10 on 2 months from the date of signing the contract. Now, the buyer will pay for the price he determines, which would be USD 1,000. The purchase will happen at the future date, now if the price of the XYZ Company’s stock is USD 12 per share, the buyer benefits and keeps the profit. Similarly, if it is USD 8 at the time of purchase, the buyer will not be reimbursed. This type of market was initially created for agricultural products such as Corn. It was created to protect the farmers from a steep price drop in corn prices. In this, the price of corn is often determined at the beginning of the season and a price of the corn is locked in even before it is harvested. Once the price is locked in, they forfeit the profits if corn prices rise sharply, but they no longer risk suffering loses if prices fall sharply. This contract is often used my companies that require purchasing goods, whose prices are volatile. Let’s assume Company ABC requires purchasing sugar for making cookies, a product they sell on a large scale. Now, if they want to make a profit they need to purchase sugar at a stable rate without having to cater to the fluctuations of the market. So, they enter into an options contract with farmers to purchase a certain amount of their crop at a certain price during an agreed upon period of time. So, if the prices of sugar rise at that time in the future, they would not have to pay the higher prices and will pay the price that was decided.